How would you like a commercial roofing solution that provides industry-leading protection, extends the life of your existing roof, and lowers your energy costs? 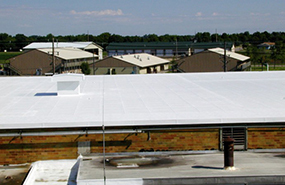 Elastomeric roof coatings do all that—and more! 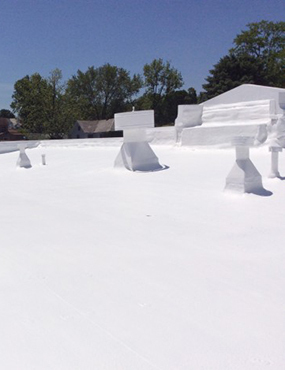 To find out if an elastomeric roof coating is a good option for your commercial roof, call the E&E Construction Company team at (740) 331-0695 today! Energy efficiency: Typically white in color, elastomeric coatings reflect thermal energy rather than absorbing it, which lightens the load on HVAC systems and helps lower energy costs. Time savings: Elastomeric coatings are applied quickly with minimal disruption to a client’s business operations. Certification: The elastomeric coatings used by E&E Construction are certified to meet ENERGY STAR®, LEED and other energy code requirements! Cost savings: Roof coatings are significantly less costly than a full roof replacement, preserving an existing roof and extending its life rather than requiring an expensive roof tear-off and replacement. Fortification: Elastomeric coatings seal your roof, make it water-tight, and protect it from Mother Nature’s elements. 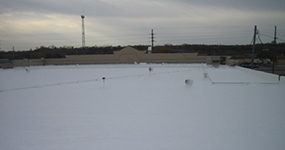 Reduced cracking: Elastomeric roof coatings will hold up in any weather, expanding and contracting with the changing temperatures. Due to this flexibility, the risk of cracking is significantly lessened. For all of your roofing needs, including high-quality elastomeric roof coating application, call E&E Construction today at (740) 331-0695. We are dedicated to delivering the highest-quality workmanship and exceptional customer service to our valued patrons, also giving them the peace of mind that comes with knowing their roof is in capable hands. Call us today! One of our knowledgeable technicians stands by to assist you.